Barcelona Accessibility Conference – European Issues ? 2009-03-24: Permit me, first of all, to vigorously reclaim the word ‘accessibility’ back from the Transport Sector. This important conference in Barcelona was not about transport networks or distances from the nearest transportation node … but about Accessibility of the Human Environment for People with Activity Limitations (2001 WHO ICF), i.e. Accessibility-for-All. A 2-Day Conference organized by EuCAN – the European Concept for Accessibility Network co-ordinated from Luxembourg – it was held in the TRYP APOLO Hotel (Av. Paral-lel, 57-59), on the 19-20th March 2009 … an impressive start-up event for the next EuCAN Project … a publication elaborating the business opportunities being created by Design-for-All for manufacturers and service providers across Europe. Colour image showing the Title Page (only) of CJ Walsh’s Presentation: ‘Accessible Fire Engineering’, at the recent 2-Day EuCAN Conference in Barcelona, Spain. Held on 19-20th March, 2009. Click to enlarge. Colour photograph showing the West/’Passion’ Elevation of the Templo Expiatorio de la Sagrada Familia in Barcelona, Spain. An architectural wonder designed by Catalan Architect, Antoni Gaudí i Cornet (1852-1926), and still under construction. Click to enlarge. Photograph taken by CJ Walsh. 2009-03-20. 1. News was announced at the conference that the Proposed International Accessibility-for-All Standard (at present ISO CD 21542.3) has been overwhelmingly supported (mid-March 2009) for progress to the Draft International Standard (DIS) stage in its development. If everything goes well, we should see this International Standard being published sometime during the first half of 2010. 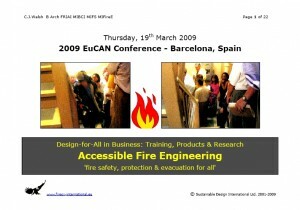 – ‘Fire Evacuation’ is fully integrated into the definition and meaning of ‘Accessibility’. 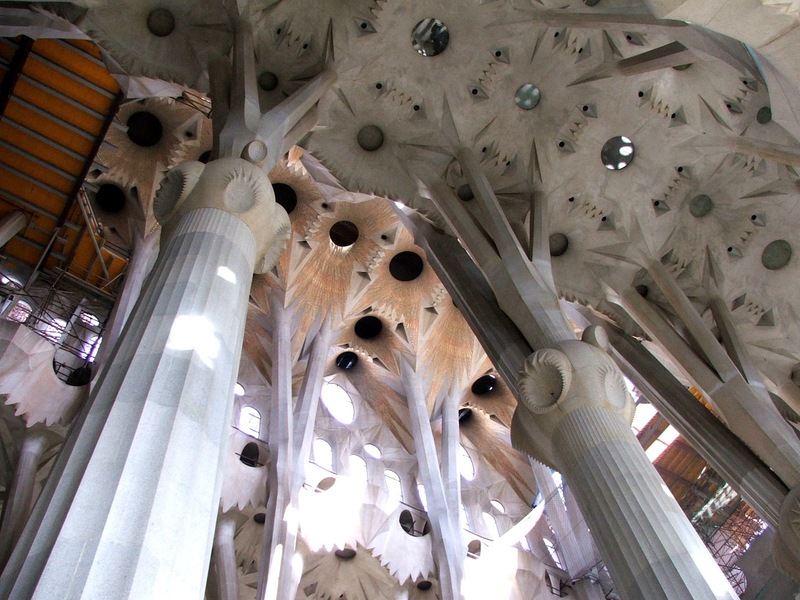 Colour photograph showing the Interior of the Templo Expiatorio de la Sagrada Familia in Barcelona, Spain. Current state of progress with the Nave. 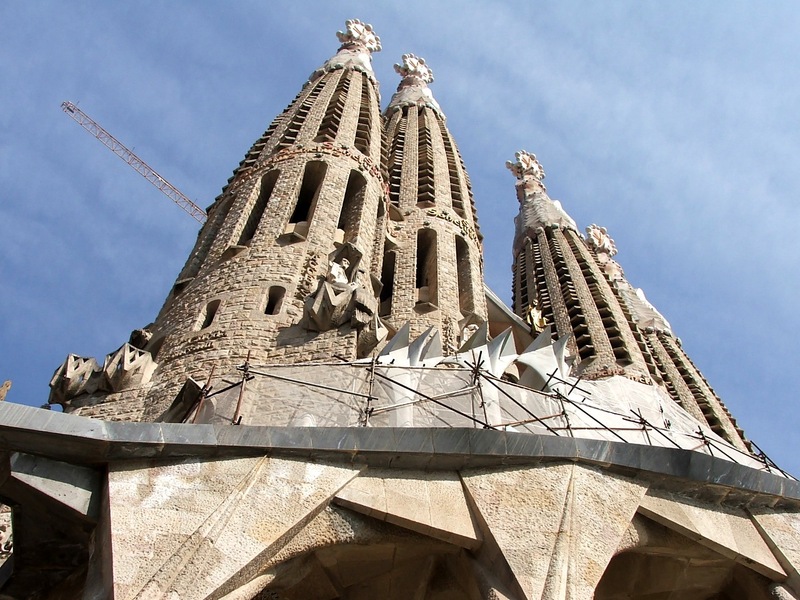 An architectural wonder designed by Catalan Architect, Antoni Gaudí i Cornet (1852-1926), and still under construction. Click to enlarge. Photograph taken by CJ Walsh. 2009-03-20. … are not only causing enormous confusion about accessibility among the ‘un-initiated’ and architectural students, to take just two examples … but are diverting scarce resources away from the process of ‘real’ accessibility implementation. In some cases, devotion to these philosophies is so consuming that I have experienced, first-hand, a general tendency to discourage any talk about rights … with some prominent members of the International Accessibility Community (who shall remain nameless !) not even bothering to read the actual text of the 2006 UN Disability Rights Convention ! 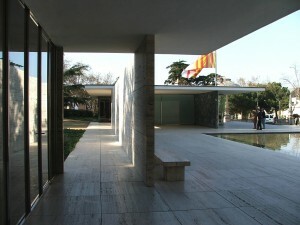 Colour photograph showing a General View, from within, of the 1929 Barcelona Pavilion – a Master Statement of Modern Architecture – designed by German Architect, Ludwig Mies van der Rohe (1886-1969). De-constructed in early 1930 after the Barcelona International Exposition, it was constructed again in 1986. Click to enlarge. Photograph taken by CJ Walsh. 2009-03-20. Yes … Accessibility-for-All is about much more than making life and living easier for people with disabilities. Children, frail older people (not all older people ! ), women in the later stages of pregnancy, people who have a health condition, etc., all now need to be included in a more Person-Centred Approach to the design and sustainable transformation of our Human Environment. This is absolutely essential. But … the 2006 UN Convention must be used as a Product & Service Checklist which covers the basic, i.e. minimum, responsible needs of people with disabilities … a sizeable social group in all of our societies. Failure to complete this simple task is a fundamental strategic error ! The 2006 UN Convention on the Rights of Persons with Disabilities is also their sole route of access to the human and social rights set down in the 1948 Universal Declaration of Human Rights. – Recruitment, Employment, Promotion & Training Practices within the same organization. Performance in all of these different, and up until now separate, components must be brought together and properly integrated. In Ireland, we suffer from an over-supply of British manufactured accessibility-related products which are badly-designed and inadequately tested … or not tested at all. Inability to show compliance with Part D of the Irish Building Regulations is a big issue … that is, if those manufacturers even realize that we have our own separate building legislation over here. By the way, failure to be able to show compliance with Regulation 7 of the Building Regulations for England & Wales is an issue across the water as well ! The situation isn’t much better in the rest of Europe. Yes … the quality of design is much, much better, but there is still enormous confusion about CE Marking. Accessibility-related Products are still, and always have been, industrial products which are being placed on the Single European Market. Normal rules apply ! Hopefully, we will soon see the demise of the Access Consultant … a plentiful species, particularly in Great Britain … an individual who only deals with ‘approach to’, ‘entry’ and ‘use’ of a building or facility … and nothing about ‘fire evacuation’. Their days are slowly numbered ! Accessibility-related Services must be dragged out of prehistoric caves … screaming, if necessary. Services must become much more professional !